The 1954 Chevrolet had a classic case of Curly (Three Stooges) Howard syndrome because it was also a victim of circumstances. The ’54 Chevy was the last of the retooled models that changed the post-war appearances of this iconic brand from the General. 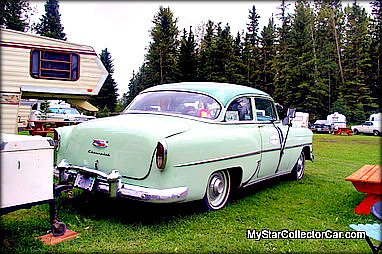 The sheet metal changes began in 1949 and morphed into the 1954 Chevrolet over the next five years. By 1955, the cars from Motor City had begun the next phase of jet-aged cars, complete with fins. The 1955 Chevy actually had modest fins, but it was clearly a radical departure from the outdated ’54 Chevy. 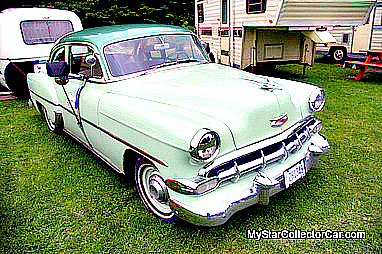 The’55 was also a founding member of the Tri-Five Club, a famous trio of 1955-57 Chevy model years that have become the stuff of legends from Detroit. 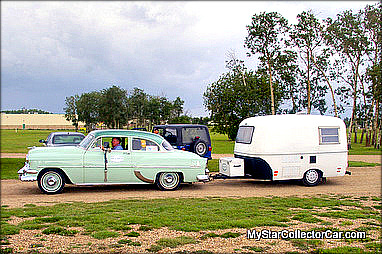 The result was the 1954 Chevy has become stuck in the giant shadow of its younger siblings. 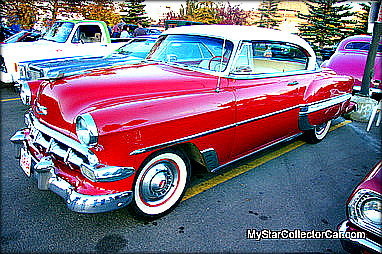 There are no songs that celebrate ’54 models and the cars are not revered by millions of admirers like the Tri-Fives. I have always liked the ’54 Chevy model, largely because of a moment in my childhood years when a neighbor parked one due to mechanical failure. We were friends with his kids and spent time behind the wheel of that stylish but inert two door hardtop/lawn ornament. The memory was always a pleasant reminder of the time from my childhood when the car culture had begun to take root in my life. That old ’54 Chevy that didn’t run was a part of that process. 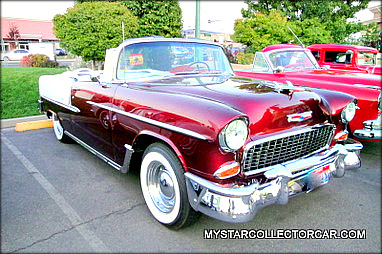 So I am always happy to see a 1954 Chevy at a car show. They still don’t steal the thunder from their younger stable mates from the Tri-Five era, but a sizable number of car guys have developed a healthy respect for these cars. Maybe the newly found respect stems from the cold hard fact that they are not very plentiful in 2012. Most of them simply disappeared from the landscape, possibly because Dinah Shore wanted people to “see the USA” in newer Chevrolets when they came to the automotive showrooms. 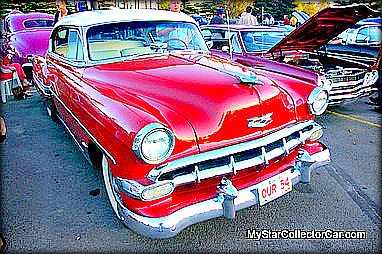 Sadly, the 1954 Chevrolet became yesterday’s news in a hurry and few people mourned the passing of its dated look. These days the ’54 Chevy is a celebration of that dated look, the car style that bridged the gap between the war and the post war era of space age possibilities. It was sleeker and lower than its predecessors, but not quite sleek and low enough to carry the freight through the entire finned 50s. However, it is still a striking automobile that deserves more attention than it gets in the automotive world.